Milwaukee Brewers first baseman Eric Thames was one of four players this season to slug 30 or more HRs but have less than 70 RBIs. Felix Mantilla was the first player to reach this rare stat when he had 30 HRs and 64 RBI in 1964. The four players this year were Thames (31 HRs-63 RBI), Kyle Schwarber (30 HRs-59 RBI), Scott Schebler (30 HRs-67 RBI) and Lucas Duda (30 HRs-64 RBI). There have now been 12 players since 1901 with 30 or more home runs and less than 70 RBIs in a season. The four this year was the most in a season. Schwarber, Curtis Granderson and Jedd Gyorko hold the record for fewest RBIs with 30 or more HRs… they each had only 59 RBIs with 30 or more home runs. Schwarber did it this season, while Granderson and Gyorko did it in 2016. 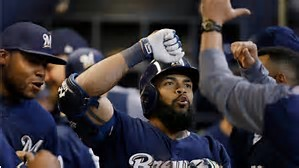 Brewers’ first baseman Eric Thames slugged his team-leading 27th home run last night in the team’s 6-5 win over Cincinnati. When you look at Thames’ numbers for this season, one stat seems to jump out… although he has 27 HRs and leads the team, he only has 51 RBI (third on the team behind Shaw and Santana). It will be interesting to note if Thames gets 30 HRs this season and if his RBI totals stay low. Of all the Brewers players who have hit 30 or more homers in a season, the fewest number of RBI was 82 by Tommy Harper in 1970 (he had 31 HRs and 82 RBI that season). Two other Brew Crew members had only 83 RBI with 30+ homers: Corey Hart in 2012 had 30 HRs and 83 RBI; Prince Fielder in 2010 had 32 home runs and 83 ribbies. At the MLB level, there have been eight players in history to have 30 or more home runs in a season with less than 70 RBI. Last season a pair of players (Curtis Granderson of the Mets and Jedd Gyorko of the Reds) each had 30 HRs and only 59 RBIs. That is the fewest number of RBI’s of a player who slugged 30 or more home runs in a season. The “they” are the Milwaukee Brewers, and the “it” is winning games and sitting in first place in the National League Central. The answer to this type of question has a lot of potential responses. 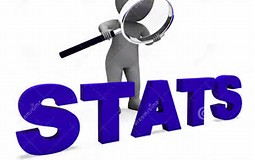 Let me point out three players in particular (Zach Davies, Travis Shaw and Eric Thames) with a handful of stats to trumpet their first-half success. Zach Davies: The second-year right-hander has a 10-4 record at the break. He is the first pitcher since Wily Peralta in 2014 to have 10 wins in the first half of the season (Peralta was 10-6 at the All-Star break in ’14). Davies becomes the 15th pitcher in team history to have 10 or more wins in the first half of the season… it has happened 19 times. Ben Sheets holds the team record with three seasons where he had 10+ wins in the first half. Chris Capuano and Lary Sorenson are the other Brewers pitchers to have 10+ win before the All-Star break in multiple seasons with the team. Jim Colborn holds the team record with most first half wins with 13. He was 13-5 before the All-Star break in 1973. Of the pitchers who had 10+ wins in the first half of the season with the Brewers, only two were able to win 20 for the season: Teddy Higuera in 1986 and Colborn in ’73. Travis Shaw: With 65 RBI at the break, Shaw became the 12th Brewer to reach that number in the first half of a season. He is the first to do so since Prince Fielder in 2011. Fielder (three times), Carlos Lee (twice) and Greg Vaughn (twice) are the Brewers players who had 65+ RBIs in the first half of a season multiple times. Fielder holds the team mark for most RBIs in the first half of a season with 78; he did it in 2009. Lee had 76 in 2005 and Vaughn had 75 in 1996. Other Brewers players with 70 or more RBI’s before the All-Star break were Jeromy Burnitz (73 in 1996), Lee (73 in 2006), Fielder (72 in 2011), Richie Sexson (70 in 2003) and Fielder (70 in 2007). Eric Thames: With 23 home runs in the first half of the 2017 season, Thames became the eighth Brewers player with 23+ home runs before the All-Star break. Fielder tops the club with 29 HRs at the break in 2007. Lee (in 2006) and Burnitz (1999) are next with 26, followed by Sexson with 25 (in 2003). Ryan Braun was the last Brewers player with 23 or more homers at the break; he had 24 in 2012. Vaughn also had 24 in 1996. Thames tied Braun (23 in 2008) and Gorman Thomas (23 in 1979). When the Brewers allowed Chris Carter, last year’s HR king, to leave the team after one season for free agency, many questioned that move. Then when they signed Eric Thames, a virtual unknown who did light up the Korean League, to replace Carter, again, a lot of people were shaking their heads. Now 20 games into the 2017 season, Thames is making a name for himself by leading the league in home runs and topping the Brewers in several hitting categories including HRs, runs scored and hits. … a healthy 13 hits short of the team record for hits in April. Braun had 36 in 2011 and Fernando Vina had 36 in 1998. The Brewers as a team top the majors with 34 home runs in 20 games, an average of 1.7 per game. That pace would give them 275 for the season. That would top the MLB record of 264 hit by the Seattle Mariners in 1997. The Brewers team record for HRs in a season is 231 in 2007. With six games remaining in April, the Brewers team could threaten the team mark for April HRs which is 39 (done in 2001). They would need to hit six in the next six games to top that mark. New third baseman Travis Shaw is also making a fast impression on his new team and fans. Shaw tops the club with eight doubles and 18 RBI. With six games remaining in April, he could realistically set new marks in both those categories for the month. His eight doubles is just one short of the team record for April, nine, held by Cecil Cooper (in 1979) and Alex Sanchez (2003). His 18 RBI is just two short of the team record held by six different players. Braun was the last Brewers player to collect 20 RBI in April (he did it in 2010).